They were an odd couple, yet clearly devoted to each other. She had poise and grace, the embodiment of Victorian America gentility. He presented Southern courtliness if you were on his good side, but woe to anyone who rubbed his thin skin the wrong way. She was around six feet tall, towering over other local women in her only verified photograph. Besides being short-tempered he was also just short, five feet, seven and five-eights inches, and that probably counted the lift gained from the elevator shoes drawn in a caricature. She was Mattie Solomon Oates; he was husband James Wyatt Oates. In 1914 she died and afterwards he fell apart like a building that lost its cornerstone. Mattie and Wyatt had no children; her legacy is (the home that would become known as) Comstock House and the Saturday Afternoon Club building down the street, where she was chairman of the building committee. Both were examples of the nascent Arts & Crafts movement and were bookends to the magnificent Paxton House which lay between them. Never again would architect Brainerd Jones have such a free hand to create not one but three buildings close together, while making an artistic statement using a cutting-edge style. Much has already been written here about Mattie; all that’s left to do is tie her story together, while daubing in missing details about her early life and death. Her lengthy obituary in the Santa Rosa Republican (transcribed below) is to be trusted, except for a few obvious typos; Wyatt was the publisher of that paper until shortly before she died. In her debutante years she was a “member of the naval social set in San Francisco” as well as a “member of the old southern set,” despite having never lived outside of San Francisco. The obit states Mattie was introduced to Wyatt by John B. Milton, a young naval officer; Mattie in turn introduced Milton to the woman he would marry. The Miltons and Oates remained close as John rose to admiral and he was a pallbearer at Mattie’s funeral. There must have been considerable romantic intrigue beneath those dry facts, however; it appears Mattie was engaged to another guy when she met Wyatt in 1880. In 1880 Wyatt was moving back and forth between San Francisco and Tucson, Arizona where he had a legal practice. In August of that year an item appeared in the Bay Area papers announcing Mattie’s engagement to Navy Lt. Emeric. Shift forward three months to the huge society wedding of her close friend Anna McMullin. Several papers listed all the guests and both Mattie and Wyatt were there – but no Lieutenant Emeric. (Guests were listed alphabetically, so we don’t know if Mattie and Wyatt attended together.) A few weeks later, in mid-December, an announcement appeared in Arizona and local newspapers that she was now engaged to James Wyatt Oates. They married August 11, 1881 and moved to Santa Rosa, where Wyatt was a law partner with a man he knew from college. In Santa Rosa, Mattie was defined by she did – and particularly what she did not. The Oates’ were never part of the McDonald avenue clique (although Mr. and Mrs. Mark McDonald Jr. were good friends), living among the professional class in the Cherry street neighborhood before Comstock House was built. The town had dozens of “ladies’ clubs” where women got together to gossip over cards; she belonged only to a single card group which included husbands. She was very involved with the Saturday Afternoon Club and its focus on the intellectual life. In 1907 she made a witty presentation on “The Laws of California as related to Women and Children” the Press Democrat printed in full. Wyatt probably had a hand in writing some of it, but her character shines through. She had a mentoring relationship with several young women, some of whom lived with the Oates’ for months on end; among those were Addie Murphy, daughter of the president of the First National Bank in San Francisco, and particularly Anna May Bell, who was treated like their godchild and ended up inheriting much of Mattie and Wyatt’s estate. For these protégées Mattie threw lavish parties and her friends did likewise. While Santa Rosa was still recovering from the 1906 earthquake, she and her neighbor Jane Paxton hosted the first post-disaster galas in honor of Anna May’s clockwork-like summer visit. The Oates seemingly had few friends their own age except those who were parents of Mattie’s youthful crowd. In 1903 some young men formed a dancing club called “The Bunch,” renting lodge halls around town for monthly dances. From the beginning Mattie was listed as a “patroness” for the events, which presumably can be translated as, “the chaperone who paid for almost everything.” Attending these dances were the same twenty-somethings who came to Mattie’s protégée parties plus young marrieds, such as Mr. Shirley Burris and his wife and Florence Edwards with husband James. Shirley was the owner of an auto dealership and the recreational driving buddy of Wyatt; the Edwards became among the Oates’ closest friends. She became a semi-invalid after her first heart attack in 1911 and her death certificate would later date the beginning of her illness to that year and name the cause as “dilitation of heart” – an old-fashioned name for enlarged heart (cardiomegaly). From that point on it was a prolonged deathwatch. What few mentions of her in the society columns over the next few years usually concerned her failing health. The last time she held a dinner party at her home was in August, 1913. Predictably, it was in honor of Anna May, now married with a small daughter. Her coffin was placed in the holding vault at the Rural Cemetery, where it would remain until after Wyatt died seventeen months later, still lost in melancholy and likely more than a little mad. At his deathbed request both their bodies – along with the previously buried remains of all her relatives – were cremated together with their ashes thrown to the winds. Mattie’s presence is still felt in Comstock House; the seven-foot clawfoot tub reminds us of her tallness, as does the unusually high bathroom mirror. And sometimes in the back hall at night, in autumn when the house is very quiet, the drafts swirling from upstairs carry the faintest scent of something floral and old, lilacs and rose petal. Certainly it’s a whiff of some lost crumb from the previous owner’s potpourri sachets, but I instead like to think it’s a fading hint of Mattie’s’ perfume. For that instant in the quiet and dim light, the year is 1905 and here again it is that passing moment between gaslight and tomorrow. IS THAT MATTIE OATES? The proof might lie in the mums. After reading about James Wyatt Oates’ death and strange directive for mass cremation, fellow local history bloodhound Neil Blazey began looking into some of the curious corners of Oates’ life, including the dearth of pictures of Mattie. Although several images of husband Wyatt are around (five so far, including an early drawing found last week), the only known picture of Mattie was part of the Saturday Afternoon Club group photo, shown above. Her will mentioned an oil portrait bequeathed (along with other family items) to her closest living relative, cousin William W. Pepper, but a hunt for his descendants went nowhere. Mrs. Shirley D. Burris was at the wheel of the next car. With her rode Mrs. George R. Riddle, Mrs. James W. Oates and Mrs. K. W. Burris. The auto was adorned with pink chrysanthemums. Neil is confident the woman in the corner is Mattie Oates; my wife Candice, who has a very sharp eye for faces, believes it is not. I am strongly inclined to agree she is the same woman as in the group photo (which was taken exactly three months later) although the differences in lighting and her expressions make it impossible for me to cast an unequivocal vote. But complications abound, starting with the library identifying this photo as from 1912, not 1908. The Library, however, has no information otherwise about the image including where it came from. 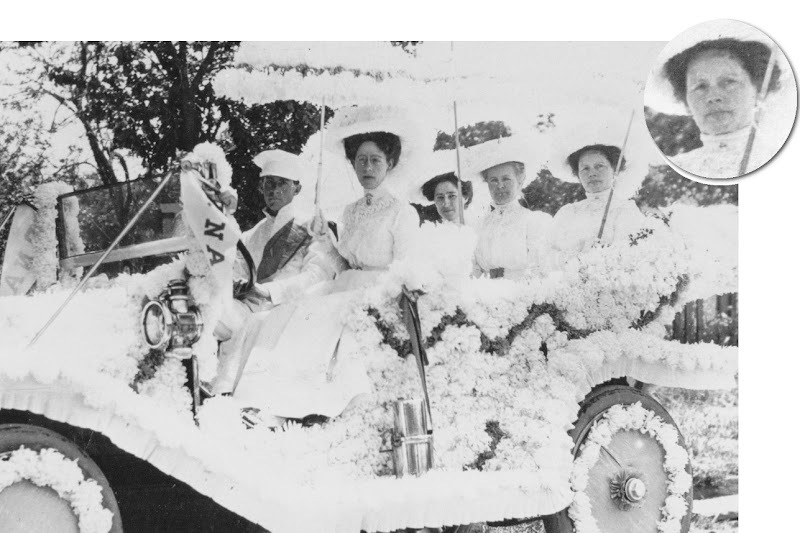 There was a car with yellow paper chrysanthemums in 1912, but the 1908 parade entry was the only possible match from that era with real mums. The 1912 car had butterfly ornamentation not seen in this picture. Also undermining the 1912 dating is the clothing. Other women in the 1908 photos are similarly wearing white dresses with high lace collars. Looking at the 1912 clothing ads in both papers plus the photo of the parade queen shows all women with their necks exposed and open collar, even sometimes a bit of decolletage. The 1908 newspaper described three women riding in the car whose age seems to match the women in the back seat: A woman in her twenties plus two older ladies. The 1912 paper mentions only young women in the car with paper mums and newspaper accounts of the carnivals in the intervening years do not allow the possibility that the photo was taken on any of those occasions. Add all this up and it’s 1908: 3 and 1912: Zip. The final complication is that the two people in the front seat are not mentioned in the paper, yet are the only two who can be positively identified. 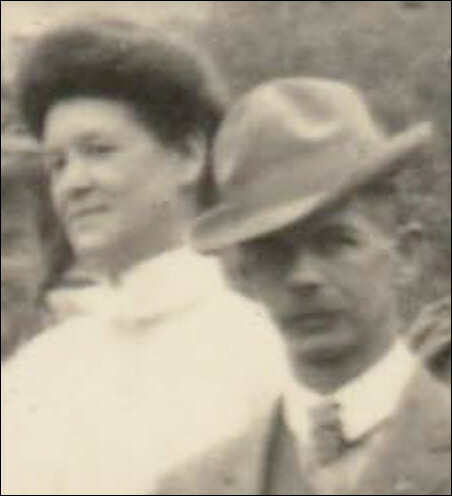 Mr. Shirley Burris was the husband of the woman driving the car in the parade and Florence Edwards was part of the Oates’ tight social circle that included Mr. and Mrs. Shirley Burris. Still all in all, “the mosaic of information” (as Neil poetically wrote) lends a very high probability that it’s Mattie. What do you think? One of Santa Rosa’s most estimable and lovable women passed to eternal rest early on Saturday morning, when Mrs. James W. Oates eyes were closed in the sleep that knows no waking this side of eternity. Gently falling into peaceful rest, as a child drops off to slumber after hours of play, the deceased’s life passed out, and gave surcease from earth’s pain and suffering. Her death has left a void in the hearts of the people of Santa Rosa, which can never be filled, and her life will be a precious memory to all who knew her until the end of time shall come to them. For many years Mrs. Oates had been a resident of Santa Rosa. She was the daughter of Mr. and Mrs. Solomon, prominent residents of this state. She was a gentle woman, and possessed of admirable qualities of heart and mind, and endeared herself to all with whom she came in contact. She had a wide circle of friends, her activities having touched all classes of society, and she will be greatly missed by the entire community. For several years past Mrs. Oates had not been well, the last sickness and death of her mother, Mrs. M. S. Solomon, having proved a great blow to her. Her waning strength flitted slowly, and the efforts of physicians and the best of care and attention proved futile in staying the hand of disease, which had marked her for its bright victim. To her mother, Mrs. Oates was the personification of devotion, and throughout the long illness of the mother Mrs. Oates gave her every attention. Following the monther’s death the health of Mrs. Oates broke perceptibly but she was the center of an admiring throung of friends, and her presence was always desired by those who knew her. As hostess of the hospitable Oates residence the deceased entertained lavishly, and her guests were always delighted with a visit to her home. She was of the stately Southern women type and was much admired by her many friends. Mrs. Oates was one of the first presidents of the Saturday Afternoon Club of this city, and to her untiring energies is greatly due the magnificent club house erected by the organization in this city. She was always assisting in all of the events which the club arranged, even when her strength did not permit, and never lost her interest in that splendid organization of women of this city. In her zeal for its welfare she went to extreme lengths when they were to her detriment. In his bereavement Colonel Oates has the sympathy of a wide circle of friends. The hand of affliction has been laid heavily upon him in the removal of the partner of his life’s joys and sorrows, and it is a severe blow. Death came to Mrs. Oates just after the midnight hour, when another day was beginning with all its bright prospects. To her it was the closing of a life well spent, and in which her good deeds were daily done. It can be truly said of her that she never let her left hand know what the right did, and her charities were many and done without ostentation. Many have been the recipients of her bounty, and her words of good cheer have smoothed out seemingly impassable obstacles in the pathway of others. She was genuinely happy in assisting others less fortunate than herself in the possession of this world’s goods. She was reared a Christian and devoted herself to the work of the church, being a member of the Presbyterian church of this city and one of its regular and devoted attendants. She supported the church and its institution at all times, and her voice was lifted in praise of the Master. Mrs. Oates will be missed from her accustomed walks of life among the people of Santa Rosa, and it can be truthfully said of her that the world is better for her having lived therein. Mrs. Oates was the daughter of Major and Mrs. Perrin L. Solomon, her father having been a Mexican war veteran, and he was a United States marshal for California under President Buchanan. He held many positions with honor and credit. Major Solomon passed away in San Francisco in the year which closed the civil war, 1864 [sic]. Four children were born to Major and Mrs. Solomon, three of whom died in infancy. Mrs. Oates became the bride of Colonel James W. Oates on August 11, 1858, [sic] and their married life was of almost thirty-three years duration. It was one of loving helpfulness and closest communication of mind and soul. Mrs. Oates was a decidedly talented woman, and of a high intellectual order. She was born in San Francisco on September 11, 1858. As Miss Hattie Solomon [sic] she was a member of the naval social set in San Francisco, and had one of the most charging of young girlhoods and woman hoods. She was a member of the old southern set, noted for its courtliness and chivalry, and associated with the Maynards, McMullins and Gwynns and enjoyed a most beautiful girlhood. One of the pallbearers at the funeral will be Admiral John B. Milton of San Francisco. Admiral Milton was a young naval officer in San Francisco when Colonel Oates reached that city from his southern home, and shortly after the gentlemen had met, Admiral Milton told Colonel Oates he desired to introduce him to a charming young lady friend, and it was thus that Colonel Oates was presented to Miss Mattie S. Solomon, and subsequently wedded her. By a singular coincidence, not long after Admiral Milton had introduced Colonel Oates to the lady who was to become his wife, Miss Solomon in turn introduced Admiral Milton to a young lady friend, and they were inter married. The lady friend was Miss Hattie Steele. The friendship thus formed was maintained to the end and Admiral Milton has been solicitous for the welfare of Mrs. Oates in her recent illness, making daily inquiries by phone to ascertain her condition. The quartette were the closes kind of personal friends since early manhood and womanhood. Admiral Milton is now retired from active service. The great friendship of Admiral Milton and his wife, extending over these many years, demonstrated the durability of the ties Mrs. Oates always wove about those with whom she came in contact. Everybody loved her for her sweet disposition and her beautiful character. Funeral services will be held on Sunday afternoon from the Oates residence on Mendocino avenue at 2:30 o’clock, and Rev. Wills G. White will return here from Carmel to conduct the services. Her remains will be deposited temporarily in the receiving vault until the concrete vault on the Oates lot is prepared and they will be tenderly deposited in a flower lined tomb beside her mother. There will be services at the cemetery. The pallbearers will be Blitz W. Paxton, Elwyn D. Seaton and Charles A. Hoffer of this city; Charles H. S. Rule of Duncan’s Mills, William E. Woolsey of Berkeley and Admiral John B. Milton of San Francisco. Through her last long and trying illness she fought bravely and cheerfully. ‘Even to the last her thought was those dear to her and to them continually tried to speak words of encouragement. Mrs. Oates was a devoted member of the Presbyterian church and worked in the past diligently in its upbuilding. She will be greatly missed and her kind words and works will never be forgotten. Colonel and Mrs. James Wyatt Oates charmingly entertained Wednesday evening complimentary to Mrs. S. T. Dunlap of Los Angeles and Mrs. William Martin of San Anselmo. Covers were laid for twelve around a table that was beautified with an artistic decoration of Dresden bouquets set in cut glass vases. A tempting course menu was served. The guests were: Senator and Mrs. Thomas Kearns, Mrs. J. D. Galllvan, Salt Lake, Dr. and Mrs. Jackson Temple, Mr. and Mrs. C. A. Wright, Mrs. S. T. Dunlap, Mrs. William Martin and Hilliard Comstock. Little Sue Dunlap accompanied her mother from Los Angeles and has been much admired by Santa Rosa friends. Mrs. James Wyatt Oates, who has been confined to her house for a fortnight, is much better, Mrs. Oates’ indisposition was caused by over-exertion, and a complete rest quickly restored her. Miss Mattie Solomon, who was the guest of the Misses McMullan, of San Francisco, last winter, is soon to be married to Lieutenant Emeric, formerly of the United States steamer Tuscarora, now on detached service. The San Francisco Chronicle says: The marriage of James W. Oates, of Tucson, Arizona, to Miss Mattie Solomon, of this city, has been announced to take place either during the latter part of April or the first of May…Mr. Oates has been practicing law and at the same time engaged in mining interests for the past ten months. The Marriage in San Francisco of Miss Mattie A. Solomon to Mr. J. W. Oates. The event of the week in society circles in San Francisco was the marriage on Thursday evening last of Miss Mattie A. Solomon of the Bay City to Mr. J. Wyatt Oates of Santa Rosa. The ceremonies took place at half past eight o’clock at St. John’s Presbyterian Church on Post street. The interior of the edifice was elegantly decorated and the dresses of the ladies magnificent. Misses Rebecca McMullen, Alicia Morgan, Adele Martel! and Lillie Gurke acted as bridesmaids and Messrs. Horace G. Platt, Arthur Shatluck, C. J. Swift and R. B. Haffold as groomsmen. Miss Solomon, the bride, is the daughter of Mrs. W. S. Solomon and is well known in San Francisco. She has been one of the leaders in society circles, where she made for herself numberless friends by her uniform courtesy and gentle manners. The groom, J. Wyatt Oates, of the firm of Whipple & Oates of this city, though not long a resident here, is well known to all our citizens. He is a gentleman of scholarly attainments and a lawyer of ability. He is a graduate of one of the first colleges of old Virginia. He practiced his profession with merited success for several years in Alabama, and he moved to this State about two years ago. Subsequently he was a resident of Arizona until he came to Santa Rosa and entered into partnership with Hon. E. L. Whipple who was a schoolmate of his in the Eastern States. At the conclusion of the ceremonies on Thursday evening an informal reception was held at the residence of the brides parents. On the morning following the happy couple left on a wedding tour of several weeks. Mr. and Mrs, Oates will return to reside in this city.